You can view the trailer for the History Channel feature here (it’s too short to be worth embedding here). While there’s plenty of controversy over the credentials of the Shroud of Turin – in a poll here on TDG last year (“What do you think of the Turin Shroud?“), a substantial majority of TDG readers said they think the religious artefact is not the burial shroud of Jesus Christ – it certainly looks like a bit of fun and puts a new spin on the old “what did Jesus look like?” question (e.g. in this Popular Mechanics feature from 2002). Trying to make out the facial features of the man who allegedly was buried with the shroud is nothing new. Here’s an image that I think was made after the first scientific evaluation of the sindone in the 1970s. So this new attempt to milk the sacred cow by the History Channel might bring more new CG kung fu; but the first thing that bothers me from that one screen-captured image being used to promote the show, is that it doesn’t seem to show the face of the buried man with a broken nose. And a broken nose, if I remember correctly (aside from a hematoma in one of the eyes I think) was part of the results thrown by the first serious studies on the shroud. Of course it is the magician Leonardo. He was well know for his ‘trickery’. 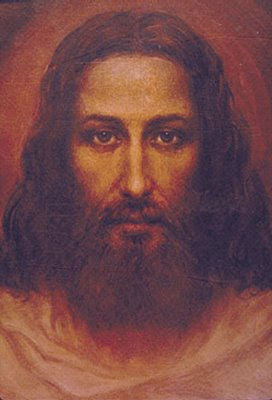 I came across a description of Jesus recently, written by a roman who saw him, he wrote that Jesus, was incredibly handsome, and quite unlike any other man he had seen. I found it on google. Human beauty is of course something a bit subjective, even though there are some studies that link the symmetry of a person’s face with how appealing it is to others. Was Jesus physically handsome? we have no way to know based on the accounts given by the people who knew him personally. Add to that the fact that Jews were forbidden of having portraits of themselves or other members. But I think that at least we can safely rule out that he suffered from any major deformities. And the reason i state that is simple: back then diseases and infirmities were considered punishment by God, either for your sins or sins committed by your parents. Such a person wouldn’t have been deemed worthy of preaching to the people as a Rabbi. Well, we could assume perfection considering the virgin birth, meaning no male DNA, so his looks maybe even on the feminine side ?? I’d bet the render turnout will look a lot like Leonardo Da Vinci. if it’s done honestly that is. I’m sure behind the scenes there will be strict guide lines to follow. It’s all about ratings after all. for the spelling lesson. I don’t edit quotes, no matter who’s they are. If you know what the word means, then it is sufficient. Enough with the Leonardo thing! People – it’s NOT a photograph. And, if it’s a fake – which I seriously doubt – then it was a 100 years too old, at least, to be by Leonardo. Knight & Lomas’s theory it’s an imprint from Jacques de Molay is about the most plausible of the “Medieval Shroud” theories. BUT the C-14 dating was from the wrong part of the Shroud! A late Medieval patch! Everything else about it is consistent with a 1st Century origin – the only undatable bit is that Image. Could the cloth be old, but the image Medieval? I don’t think we can ever know via a scientific test. Only history can say if the thing is for real. And then the evidential link to JC is even more tenuous – or is it?